Linda asked me a great question and while writing back to her, I ended up writing the history of how we got here, so to speak, therapy-wise. I thought it might be a great thing to share with my readers, as it gives you an insight to how we got to the diagnosis of SPD, and what process we have taken with therapy and assessments of the boys. Assessments are a struggle for all families with children who have been hospitalized in the NICU, because you're always waiting to see if your child(ren) have "caught up." Instead of a lot of answers, we found ourselves looking at scores and data that didn't give us a "what to do next." My boys were flagged from the NICU for Help Me Grow, which is our state's program for helping families with children who might have additional need. 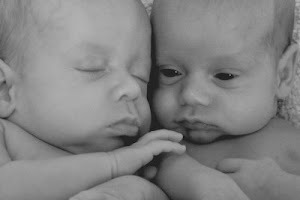 Right out of the NICU they were assessed, and we were forwarded on to our county board of MRDD. Through them we started monthly PT, OT and EI. We also did developmental assessments through the NICU outpatient program at the hospital, which now looking back I realize were only a benefit to our NICU Hospital and its research, and not much benefit to us. They continued on like this until we moved in April. In Ohio, each county's MRDD has a different system. Our new county has an amazing one which allots each family a budget line for therapy, and another for community classes, equipment, etc. We were given a budget and allowed to pick our therapists, pick anything we wanted. (within reason) AKA< we now had choice! Wehn we transferred counties, we found out that the old county had not followed up with assessments of the boys like they were supposed to. They had forged paperwork, etc. And they made the new county look "bad" with some of their practices. The director of the new county "took us under her wing" while they re-evaluated the boys and got everything re-written and fixed. She brought up the possibility of sensory issues, and referred us to our current OT who is AMAZING. She (the new OT) had just gotten back from the STAR institute and had done a mentorship with Dr. Lucy Jane Miller and was wanting to try out her new method of therpay delivery which was based off a system of "bursts" of intensive therapy. Dr. Miller's research showed this method was more effective for the kids and led to greater results. Our new OT did the SIPD (sensory profile) with our kids and we learned they had SPD. A lightbulb obviously went on, and I wish we'd had someone so observant from the get-go. I am now learning SPD is not often diagnosed much before 2 years old. So here we are. The boys go to therapy with our new OT for 1 hour 3 times a week during which we fully participate in sessions. We incorporate everything at home. We do the brushing protocol 6 times daily at 2 hour intervals. And we do the listening therapy 2 times a day for 30 minutes each. It is overwhelming but I can't tell you how much progress they have made in the 4 (or is it 5?) weeks since they started. We have equipment that should come to the house in the next few weeks including a trampoline, body sox, weighted vests, vibrating "bugs" and we're looking at what more we'll add. Jack has always struggled with feeding and our OT thinks it could be from his Postural disorder/low tone which also extends to the mouth. I struggled so much with feeding him out of the NICU, I thought he wouldn't make it. It was a nightmare. If only someone could have helped me with that then! I will say therapy for other sensory things, like daily therapy, brushing, and listening have all increased their range of foods. They aren't awesome eaters, but they're not terrible either. Both have texture issues. One thing our OT will do more of in the next burst is using the vibrating toys in their mouths. Also, she has Jack practice blowing bubbles to increase muscle tone in the mouth. I will say that both my boys are below the weight charts and I have had to let go a little with my worry about their eating, in order to prevent mealtime from becoming a power struggle. I think that while they have obvious texture issues, I am thankful they are not limited to only 5-10 foods like some of the children I read about on my SPD listserve are, so I am thankful for that. Sara, What makes me even angrier is that my insurance paid at a rate of 400 an HOUR for those NICU assessements! They had actually written Sumner's wrong at the 2 year appointment. I agree that the HMG/MRDD wait can be frustrating. We were waitlisted for MRDD as well. However, I don't know about you but my insurance does not pay for therapy. With two, therapy can be overwhelmingly expensive. Thank you so much for sharing your story! I am a mom of a 2-year old boy, who stumbled upon your blog shortly after the boys were born, I am also an Occupational Therapist, (most recently working in geriatrics with a dream of pediatrics), and originally from Ohio (currently living in North Dakota!) 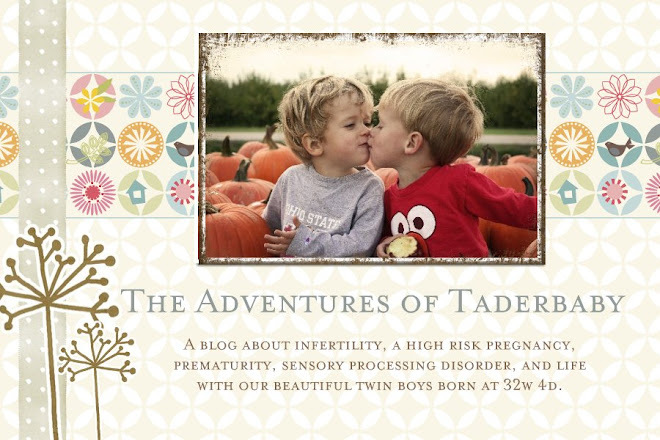 Your story and blog are so real, I get little bursts of joy inside with all of the progress the boys are making (and secretly cringe along with you at some of the sensory things used to progress the boys!) Thank you for your passion and honesty!! The weighted vests and the bugs are awesome! Good luck with the oral vibe stuff!! !